Like previous years, I will write a "live" Conference Report on this website including details (and photos - when I'm back on thursday) of all major events, Borland and 3rd-party announcements and session details. My personal focus will be on Delphi (for .NET) and C#Builder, but I also look for any news on C++Builder (6 and X), Kylix, and JBuilder X (it was only 7 at last BorCon and now version X already!) as well as other new developments. Conference attendees were given the opportunity to purchase Borland products with roughly a 50% discount, and software assurance at the same time (which gives you the right to free upgrades/updates within 12 months). That's a very good deal, and probably has provided for an ROI on BorCon for a lot of people already (even apart from the knowledge and insight gained from the numerous sessions). This year, I was selected to give a pre-conference tutorial as well as regular sessions, so I arrived on Friday evening. The world was spinning a bit (it always is, but this time I felt painfully aware of that fact), so I turned in early (or late, depending on your biological clock). Today I attended a number of pre-conference tutorials, like John Kaster's afternoon session about C#Builder (see picture). I've heard mixed feelings about C#Builder - some people like it, others dislike it, but I have to say I really love to work with it (although I do need to work at a higher resolution than I used to). I also took the time to meet with some people and enjoy the computer lab (for the first update of this report). It's amazing how fast the connection speed was! And from the growing number of laptops (it's so much nicer to read your e-mail on your own machine), I imagine next year Borland only has to provide the connection, hubs and cables (or even skip the cables and offer wireless connections to everyone), since it sure looked like a 50:50 distribution between (hired) desktops and laptops. I remember a few years ago when there were only one or two laptop connections available! The second day with pre-conference tutorials is now over. During my morning pre-conference tutorial about BizSnap: XML & SOAP, I could actually use Delphi for .NET to consume and connect to a Delphi 7 Web Service (which worked perfectly, and illustrates one way to connect the Win32 world to the .NET world). Danny Thorpe's afternoon pre-conference tutorial about Using Delphi for Microsoft .NET Framework Development was packed - there was no more room, and some people were standing at the back of the room just to get a glimpse. Well, Danny used Delphi for .NET, but mainly used slides to explain what he had implemented (and what not) of the Delphi language features and enhancements that he told us last year were needed to make Delphi a real .NET citizen. It was amazing to see that just about everything - and even more than that - has been implemented, and some of the very impressive highlights include operating overloading (really! ), class helpers and unmanaged exports (where a .NET assembly can be used and called by a Win32 executable - without COM interop, just like that). 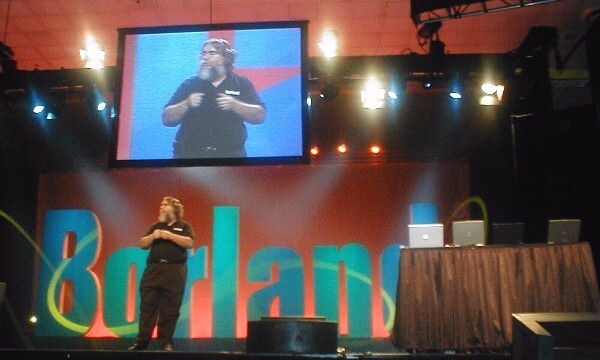 The Opening Keynote (also on Sunday, so it felt like a long day already) was fun. David I started with giving some images from Borland's past (it's the 20th anniversary), and then called CEO Dale Fuller as well as CTO Blake Stone onto stage, where they showed a tiny bit of CaliberRM, JBuilderX, C#Builder and I guess also C++BuilderX (it was a bit too brief to know for sure). We did not get any announcements of new products at this time - those were left for the general sessions (a new phenomenon of BorCon - each morning started with a general session by Borland). The Opening Keynote ended with the usual awards (partner of the year, trainer of the year, etc.) and the Presidents' Award, which this year went to Rick Nadler for this efforts and contribution to SOAP and Web Services. Congratulations, Rick! 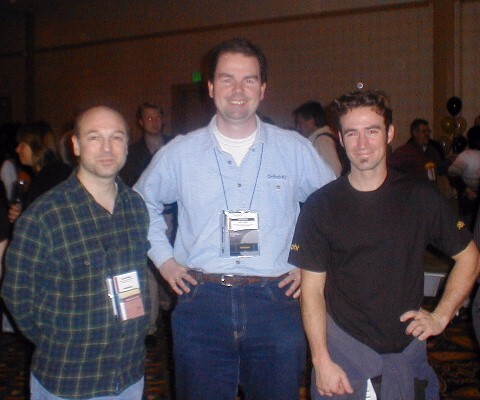 Tomorrow (monday) will bring some more news from the .NET Group (the new name for the RAD Group, which is actually responsible for .NET, Win32 and Linux stuff - not just .NET). The 8 am session will most likely feature a full demonstration of Delphi for .NET, and monday evening - after the Meet the .NET Team - there will be a special Delphi 8 for the Microsoft .NET Framework Launch Event. The general session (something they're doing for the first time this year - starting the day with a general session) was far more interesting than the Opening Keynote, and really made my day. It contained two new product announcements: Delphi 8 for the Microsoft .NET Framework and Borland Enterprise Server for java 7. See the new Borland Delphi for .NET website for more info. First, Simon Thornhill spoke about Delphi 8 (for .NET) and talked about the platform shift from Win32 to .NET (and for people who think .NET is not the future: in the upcoming WinFX, the .NET will be the API, so there's no turning back). Delphi 8 will be pure Delphi and pure .NET. We will be able to write new .NET applications with Delphi 8 for .NET, but also migrate existing VCL applications from Win32 (or even Win16!) to .NET. 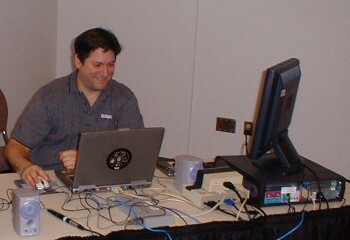 Then Michael Swindell came on stage to actually demonstrate the Delphi 8 for .NET IDE. He built a little text string conversion application, first as VCL (for .NET), then as WinForm, ASP.NET Web Service, and finally used this web service in an ASP.NET Web Form application. He then showed the Borland Data Providers (who now also have an Access driver apart from DB2, SQL Server, InterBase and Oracle). A very nice addition to Delphi for .NET (compared to C#Builder) are the DB Web components. They include a dbwebgrid, image, and navigator, and connect to a dataView (for example) by a connecting dbwebdatasource component. A bit like the old data-aware components we all know. BorCon Amsterdam visitors: make sure to check out my pre-conference tutorial about ASP.NET web services and web forms with Delphi 8 for .NET for more details on this! As last demo, Michael showed how easy it can be to migrate existing applications to .NET (he used words like "most", "very easily", but also warned for the use of "third-party components", old or "deprecated code or components", etc. As an example, Michael loaded the 16-bit FISHFACT.DPR example from Delphi 1 and compiled it to a native .NET executable (using the BDE!) without a single source code line change! Apart from the BDE, there will also be support for dbExpress (which hooks into the "bottom" of ADO.NET) and of course the Borland Data Providers for ADO.NET (see my C#Builder articles using BDP and DB2 for example). After a brief intermezzo by Tom Murphey from the Meta Group, Todd Olsen came on stage to demonstrate the newly launched Borland Enterprise Studio for Java version 7. I must say, the ALM tools were really neatly integrated into JBuilder X, and if this is the future of what will also be found in a Borland Enterprise Studio that features Delphi, then I can't wait to get my hands on it. Very cool 2-way integration between the code and the UML model, and in fact all ALM tools. The only thing that the demos made clear was that we need bigger screens (or at least higher resolutions). I had this feeling when I first saw C#Builder and Delphi for .NET, but the Borland Enterprise Studio for Java 7 really docks everything inside the IDE, so any additional space is welcome! At the Meet the Team session, we were introduced to the .NET Team (responsible for .NET, Windows and Linux products like Delphi, Delphi for .NET, C#Builder and Kylix). Before we got the chance to ask questions, Simon Thornhill answered two questions that were asked a lot. Yes, there will be an update for Delphi for Win32, and this is still alive and well. And No, they do not know when they will have an update for Kylix - at least not in 2004, at least that doesn't mean it will never happen (but not anytime soon, that's for sure). Interesting to read, in that context, is the third page of the interview with CEO Dale Fuller and CTO Blake Stone by Tim Anderson which was give right after BorCon. 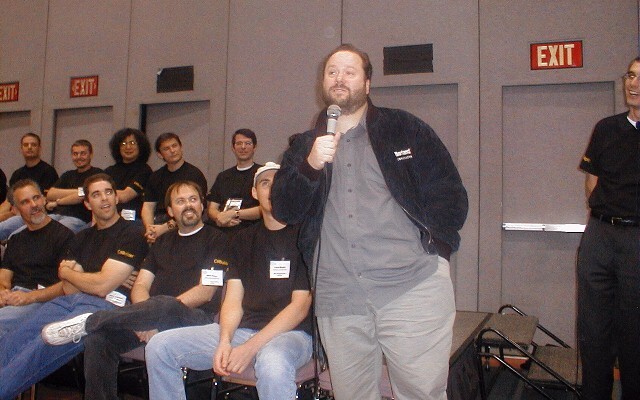 And the end of the session, I felt sure that people who are currently more interested (and committed) to Win32 than in .NET can safely go to sleep, knowing that Borland has not forgotten about Delphi for Win32, and will be coming with updates (although I have no details in which form or when, yet). 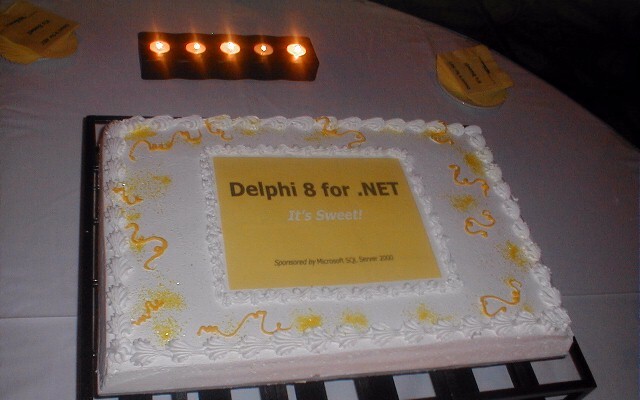 Talking about Sweet Dreams: after the Meet the Team session, it was time for the Delphi 8 for the Microsoft .NET Framework launch party, which had a great cake (did anyone dare to cut it? ), cookies, ice-cream and lots of other sweets. A lovely way to end a long day, but not without having pictures taken with some great people that I met there, like Joe Mayo (author of C# Unleashed and C#Builder Kick Start), Corbin Dunn, and Allen Bauer. Today started with my own birds-of-a-feather session (at 7 am) about RemObjects SDK, which had about 42 people in the room (amazing: is that a record for a BOF-session?). Apart from the normal sessions that I attended, there were also the poster sessions - another new and innovative thing this year. The concept and idea is really nice - have a poster placed (containing a short coverage of a particular topic or problem), with the author nearby to discuss or answer questions. It was a bit strange at first to see the posters in the middle of the exhibition area ("come look, we are not trying to sell you something"), but this is something to repeat in the future for topics that are too short or narrow-focussed perhaps to be done in an entire session. My own session introducing TClientDataSet and (moving from BDE to) dbExpress went well, and had a lot of people in the room. It was made clear at the Meet the Team the day before that the BDE is "only" frozen, but light-frozen at that, since it's still available to connect to from Delphi for .NET. SQL Links is the part of the Borland Database Engine that's deprecated and should be replaced by something else in your applications - like dbExpress (or the Borland Data Providers if you've moving to .NET). 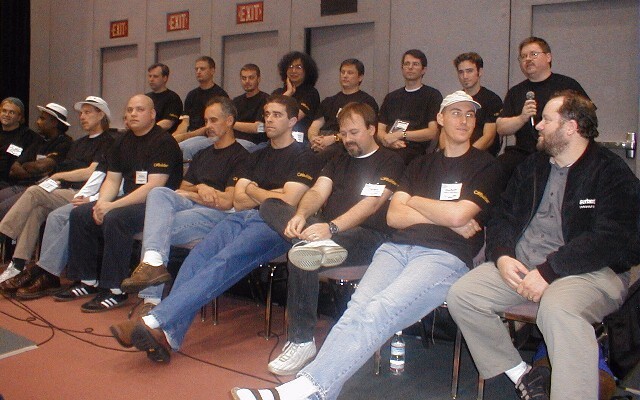 I'm afraid I forgot about the time in the tech Museum, so I missed the Meet the C++/Mobile session. 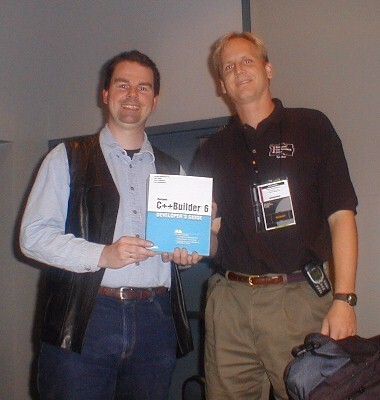 Fortunately, Paul Gustavson attended that session, and send me some notes to use here (see also the picture below where we hold a copy of the C++Builder 6 Developer's Guide that we signed at BorCon). Following introductions of the C++ team, JP Leblanc took careful time in sharing what he could not in the infamous "open letter". He provided a little bit of background of how the story unfolded and what their strategies are (Strategies 1 and 2 --- now potentially 3 if they pursue backward compatibility for VCL in their designer). Strategy 1 - cross-platform/native C++ applications via the wx framework in which there will be a significant portion of overlap (mapping) with the VCL interfaces we've come to use. Not all VCLs, however, will map easily therefore some "sweat" will be required (JP's words). Strategy 2 - .NET Framework / managed C++ applications via a new C++ compiler with managed extensions and support for VCL for .NET JP shared that the next release, which provided the Wx visual designer support would be the first half of next year. The push for providing mobile components to make mobile development easier is part of the effort as well. With the opportunity to ask questions, many audience members shared their concern, disappointments and desire for supporting existing BCB projects with the new product. It became obvious that some type of "bridge" is need for taking BCB6 VCL-based projects to the next destination "without leaving anyone behind on the corner." So, JP begin openly proposing a 3rd strategy, which they will now elevate in their list of considerations. Strategy 3 - Win32 C++ applications via the existing VCL heritage. Designer needs to support VCLs (or perhaps a swappable designer between the WxFramework and VCL framework). Strategy 4 - Development and release of a Win32 development IDE studio for C++ and Delphi developers (a best of breed supporting both Pascal and C++). 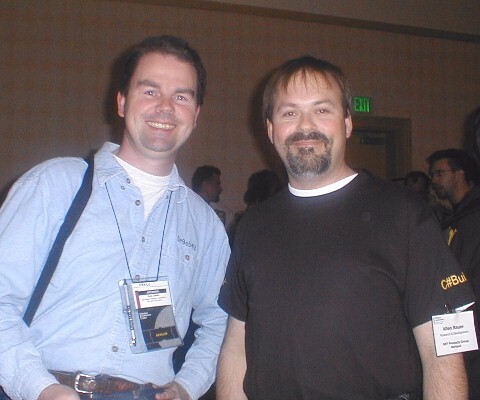 This would potentially satisfy the large number of Delphi users who plan, want or need to continue to develop Win32 apps (but also feel like they're left out in the cold with Borland's focus for Delphi for .Net). Strategy 5 - Update and maintain C++Builder 6 for a period to support the breed of developers who need to maintain Win32 VCL based projects. This would include bringing BCB up to VCL7 and correcting some of the more significant bugs. The one drawback with this approach (and Strategy 4) is that migration would still need to be considered at some point for moving to Strategy 1 and 2. Other notes, they are working hard with the WxWindows guys to make the necessary changes for full Visual RAD support and have formed a brand new organization called wxsf org. Thanks again to Paul Gustavson for sharing his notes and insights! 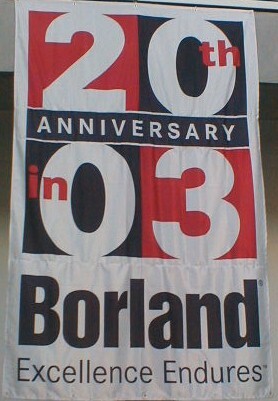 Of all the Borland Conferences I attended, I was only able to see the closing session one time (in San Diego, 2000) because my plane would leave on Wednesday already. This time, my plane left early in the morning (I had to transfer at Chicago), so I missed all the sessions on Wednesday. 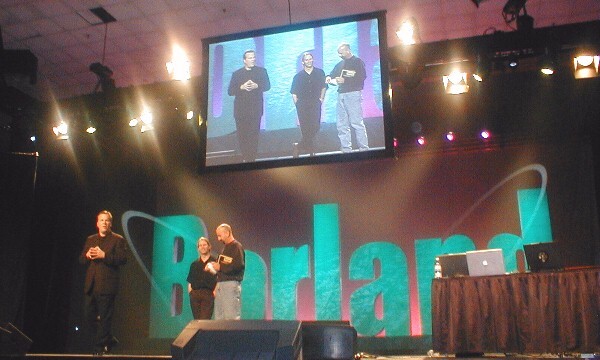 Usually, the Closing Session is the place where they announce the date and location of next year's Borland Conference, but from what I understand, Dale Fuller mentioned a few cities but never really announced where (or when) BorCon 2004 will take place. As soon as I find out, I'll let you know, of course (you can always check my events page for updates). This webpage © 2003-2015 by Bob Swart (aka Dr.Bob - www.drbob42.com). All Rights Reserved.